Republican Congressman (and Freshman!) 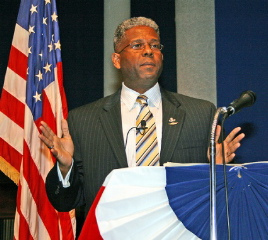 Allen West. 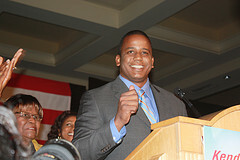 “I have seen the license plates that say there should be no taxation without representation. I have to do more research on the issue. The District of Columbia was designed to be the home base of the federal government so I would have to see what the Constitution says. If you live in the District, perhaps an exclusionary zone should be set up where District residents do not pay federal taxes,” West said. The idea isn’t exactly new, having been proposed in the past by everyone from local voting rights activists to one of the District’s biggest foes, Rep. Louie Gohmert (R-TX). There’s some obvious pros, but also some distinct cons that would need to be considered. Scrapping federal taxes would be a huge plus for many District residents, who would suddenly have a good deal more cash to invest in businesses, homes and their families. Of course, any such exemption would make the city a huge draw for just about anyone willing to skip out on paying their share to the feds — most likely the very, very rich. If we think that the District has charged dramatically over the last decade with a relatively stable influx of new residents, how would it change over the next decade when every new resident was promised a break on their federal taxes?